'Very slippy weather indeed!' Hand-coloured etching by James Gillray (1808). Gillray’s depiction of an elderly gentleman losing his footing on an icy street is highly comic. Yet, apart from one yapping dog, his spectacular tumble goes entirely unnoticed by the crowd on the pavement; all eyes are fixed instead on the paper drama of the print shop window. Print shops really did draw every eye in this manner in the eighteenth and early nineteenth centuries. Apart from the cheap woodcuts in chapbooks and broadsides, and the odd painted signboard, there was little accessible imagery in day-to-day life; the affluent might attend art exhibitions, or possess their own collections, but the print shop window was free to crowds of all ranks. It effectively doubled as a picture gallery, showcasing the latest portraits, caricatures of fashionable follies and biting satires for an audience hungry for the magic of the visual. One tourist to London observed that outside the most popular shops the ‘enthusiasm is indescribable when the next drawing appears…it is a veritable madness. You have to make your way in through the crowd with your fists’. Outside this particular shop a dandy with a monocle, a footman, an army officer, an errand boy and a coachman jostle for best position, whilst inside two clergymen pore over an impression titled ‘Catholic Emancipation’. The shop depicted is the West End business of Hannah Humphrey (c. 1745-1818), the leading caricature print seller of her day. The prints that can be glimpsed in the windows are all earlier etchings by Gillray, for Humphrey had a profitable monopoly on the sale of his satires, and this print doubles as an advertisement for his work and her shop. 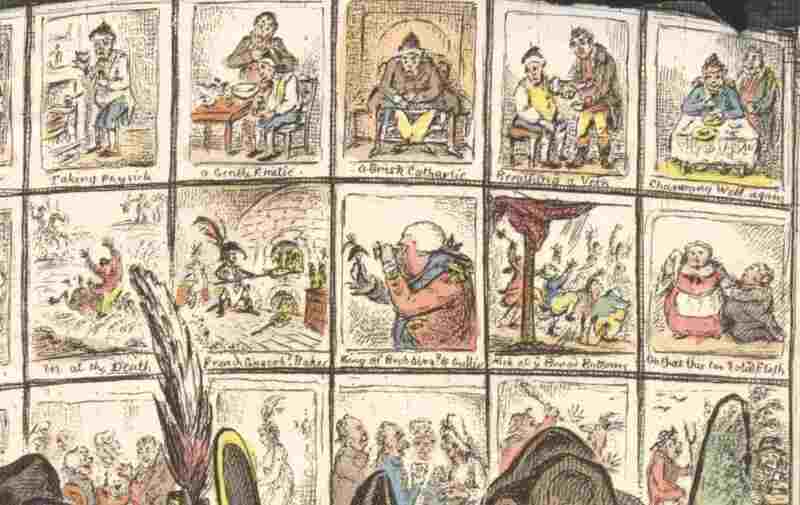 Among the prints on view are medical satires (‘Taking physick’, ‘Breathing a vein’, ‘A gentle emetic’, ‘A brisk cathartic’ and ‘Charming well again’), political satires (‘A kick at the Broad-Bottoms!’, ‘The King of Brobdingnag, and Gulliver’, ‘Tiddy-doll, the great French-Gingerbread Baker, drawing out a new batch of Kings’) and personal caricatures (‘Two-Penny Whist’, which cheekily depicts Hannah Humphrey herself). Humphrey’s premises at 27 St. James’s Street, which she opened in 1797, were in the heart of fashionable London and well placed to lure in passing nobility and gentry-the exclusive gentlemen’s clubs of Brooke’s, Boodle’s and White’s (frequented by the likes of the Prince of Wales) were just up the street. According to contemporary accounts, her shop was well appointed inside, with mahogany counters and showcases. She also loaned out portfolios for the evening. The rooms above the shop were where she lived with Gillray, who had been her lodger and close friend as well as her principal artist, since 1793 (which fueled much speculation that their relationship was more than purely commercial). Comments are welcome for sharing with other users, but regrettably the editors of Curators’ Choice are not necessarily able to respond to enquiries. This entry was posted on Friday, August 22nd, 2008 at 11:37 am and is filed under Popular Prints. You can follow any responses to this entry through the RSS 2.0 feed. You can leave a response, or trackback from your own site.